Little Belle Mont’s former herd sire and son of donor Sweetwater Rita R47, Oak Hill Objective 4208 receives Reserve Grand Champion bull honors at the Alabama Angus Association Fall 2010 sale. We are proud to announce that we just leased 200 acres. The land is in great shape and there is only a little bit of work to be done before we can move our cattle in to their new home. We have added new items to the sale page. We have listed the current set of embryos that are for sale as well as currently available private treaty bulls. Its the fourth straight day of above 100 degree heat. 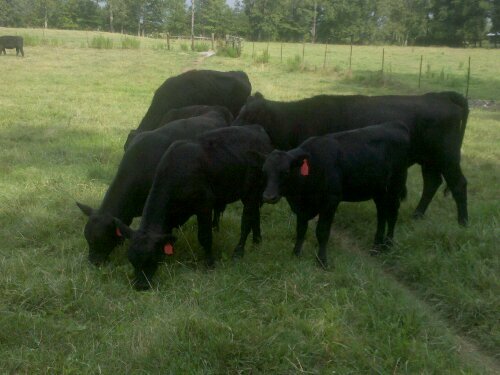 Most of the cattle are coping but a few of the E.T. calves are starting to show signs of wear. Even though we are seeing signs of wear in the E.T. 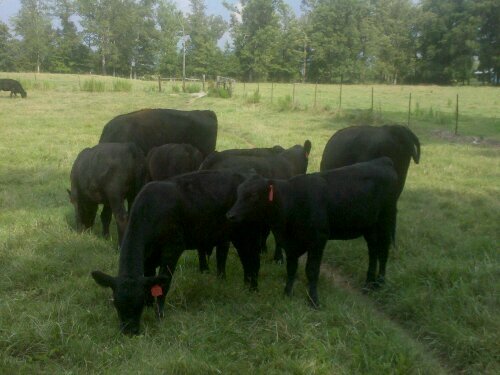 calves, this may be an indication of genetics that do not work in North Alabama. Only time will tell but lets hope this heat wave ends soon. Little Belle Mont is excited about having a new blog. This way we can keep everyone updated on what is happening on the farm. Check back soon for exciting news.